As many of you already know, I'm in love with my new Chevy Volt. It's comfortable, it drives well, it feels safe on the road. It inspires confidence in the corners and in the rain. It has Apple Car Play, which among other things means that I can have GPS navigation on my screen through Apple Maps. But more than any of this, my car has now travelled over 1,500 miles since April, and it has used less than one tank of gas total to do it. That is because it runs on electricity for the fifty miles before it switches over to the gas-powered engine, so all local driving is done on electricity with no gas necessary. Have my electricity bills gone up? I now can answer that question. The answer is unequivocally: Yes. 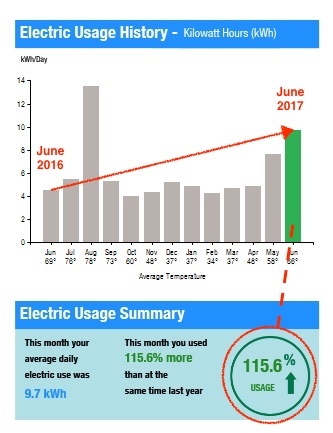 My electricity usage more than doubled when I compare June 2016 to June 2017. It went up by 115.6 percent to be precise, amounting to an average daily usage this June of 9.7 Kilowatt Hours (kWh). While that does represent a huge jump from this same time last year, my net total cost for that electricity is $67.67, a very manageable number and average daily usage of 9.7 kWh is still significantly below the national average of 29.6 kWh. Since my quick math tells me that in June 2016, I spent roughly $31.47 on electricity for that month, my net total increase for June 2017 was $36.20. Am I spending equivalent to, more than or less than I was spending on gas in my former car, an old 1999 Subaru wagon? As it turns out, in June 2016, I spent a total of $47.84 on gas. 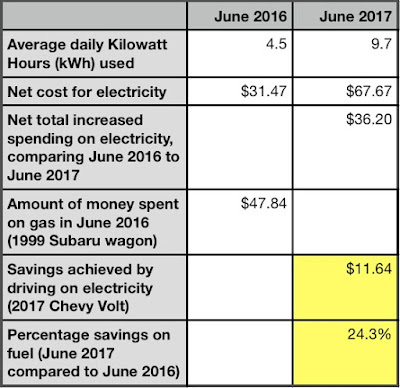 So, comparing June 2016 to June 2017, I have spent 24.3 percent LESS on automobile fuel (whether in the form of electrons or petroleum) this year than I did last year, or in dollar terms, $11.64, which as an annualized amount is $139.68 in savings by driving an electric car. Given that my car payments are $144/month, I am getting one month's worth of car usage just on my gas savings alone. This 24 percent is a real savings, and it will only increase as gas prices rise. Furthermore, while I haven't accounted for miles driven, my personal sense is that I have been driving more in my new car this year than I drove in the Subaru last year. The Chevy Volt: saving money and reducing the carbon being spewed out into the atmosphere. A win win. Addendum: Starting next month, my energy bill will increase again because I have signed up for Cambridge Community Electricity, an aggregation program where Agera Energy becomes the energy purchaser for Cambridge customers instead of Eversource. The base plan is 25% more solar that what the state requires though they also have a 100% GREEN option, which is exactly what it sounds like ... 100% renewable sources for electricity. I opted for 100% GREEN, so I'm powering my car completely on wind and solar. It costs 20% more per kWh, but if ever there were a case of "Putting your money where your mouth is," this would be it.